This Church has served the community for over 65 years, and is dedicated to the Life, Ideals and Teachings of Father and Mother Divine. In 1942 the two buildings of The Circle Mission Church at Broad and Catherine Streets in Philadelphia were purchased by a group of followers of Father Divine and set aside for the use of the Circle Mission Church. Church Services offer Spiritual nourishment to its members and those of the community who desire to attend. Holy Communion Banquets supply the Spiritual and material needs of all who will partake of this Holy atmosphere. The Church sponsors activities for neighborhood children and the school rooms hold classes in Bible study, science, music, computers and other requested subjects. In the Church Library there are copies of The New Day that contain Father and Mother Divine’s sermons, letters, and interviews which are available to the public by appointment. Those desiring the use of the Circle Mission Church Library or wish to tour the edifice may do so by contacting the Secretary, at The Circle Mission Church. Phone: (215) 735-3917, Fax: (215) 732-8310. The Peace Mission Movement of Philadelphia. Compiled and edited by Jean Barth Toll and Mildred S. Gilliam for The Atwater Kent Museum. Copied by permission of the Atwater Kent Museum Publishers of. “Invisible Philadelphia Community Through Voluntary Organizations”, Copyright 1995. The Reverend M. J. Divine, better known as Father Divine, founded the Peace Mission Movement to help human beings become conscious of God’s presence through obedience to the law of the spirit of life, and thus to create abundance and peace for all. The Peace Mission Movement has provided the necessities of life to countless thousand at a price unfortunate people could pay, and gratis to those who could not pay. 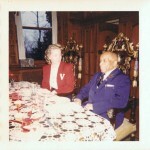 Father Divine had been engaged in feeding, clothing, and sheltering the underprivileged of Brooklyn, New York, and elsewhere since the late 1800s. He and the first Mother Divine bought a home in 1919 in Sayville, Long Island, New York, at 72 Macon Street where he housed, fed and clothed the needy gratis, without solicitation of any kind, and delivered sermons to the many who gathered around the abundant banquet table. He attracted people from all walks of life and many parts of the world who were hungry spiritually as well as physically.